Louise Hickman, Eighteenth Century Dissent and Cambridge Platonism: Reconceiving the Philosophy of Religion, Routledge, 2017, 211pp., $140.00 (hbk), ISBN 9781138652415. Eighteenth-Century Dissent and Cambridge Platonism identifies an ethically and politically engaged philosophy of religion in eighteenth century Rational Dissent, particularly in the work of Richard Price (1723-1791), and in the radical thought of Mary Wollstonecraft. 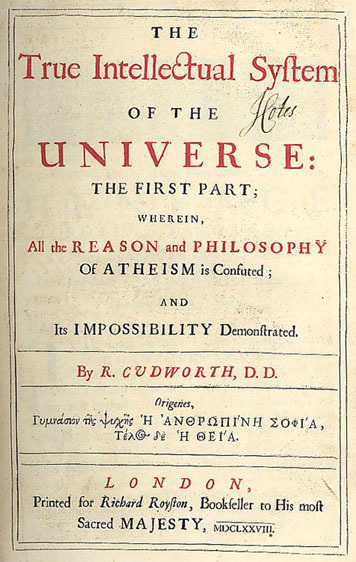 It traces their ethico-political account of reason, natural theology and human freedom back to seventeenth century Cambridge Platonism and thereby shows how popular histories of the philosophy of religion in modernity have been over-determined both by analytic philosophy of religion and by its critics. The eighteenth century has typically been portrayed as an age of reason, defined as a project of rationalism, liberalism and increasing secularisation, leading inevitably to nihilism and the collapse of modernity. Within this narrative, the Rational Dissenters have been accused of being the culmination of eighteenth-century rationalism in Britain, epitomising the philosophy of modernity. This book challenges this reading of history by highlighting the importance of teleology, deiformity, the immutability of goodness and the divinity of reason within the tradition of Rational Dissent, and it demonstrates that the philosophy and ethics of both Price and Wollstonecraft are profoundly theological. Price’s philosophy of political liberty, and Wollstonecraft’s feminism, both grounded in a Platonic conception of freedom, are perfectionist and radical rather than liberal. This has important implications for understanding the political nature of eighteenth-century philosophical theology: these thinkers represent not so much a shaking off of religion by secular rationality but a challenge to religious and political hegemony. By distinguishing Price and Wollstonecraft from other forms of rationalism including deism and Socinianism, this book takes issue with the popular division of eighteenth-century philosophy into rationalistic and empirical strands and, through considering the legacy of Cambridge Platonism, draws attention to an alternative philosophy of religion that lies between both empiricism and discursive inference. Reviewed by Sandrine Bergès (Bilkent University) here.